Dimitris Vastarouchas is Danaos Corporation Deputy Chief Operating Officer. 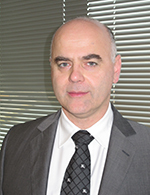 Mr. Vastarouchas has been the Technical Manager of Danaos Shipping Co. Ltd. Since 2005 and has over 15 years of experience in the shipping industry. Mr. Vastarouchas initially joined Danaos in 1995 and prior to becoming Technical Manager he was New Building Projects and Site Manager, under which capacity he supervised newbuilding projects in Korea for 4,250, 5,500 and 8,500 TEU containerships. He holds a degree in Naval Architecture & Marine Engineering from the National Technical University of Athens, Certificates & Licenses of expertise in the fields of Aerodynamics (C.I.T.), Welding (CSWIP), Marine Coating (FROSIO) and Insurance (North of England P&I). He is also a qualified auditor by Net Norske Veritas.